Whether at the office or at home in Little Rock, AR, carpets are in a constant state of attack during the cooler months. Rain, mud and dead leaves are just waiting to be tracked inside. This can cause the quality of your carpet to diminish faster than any other time of year. Carpets are a costly investment that can make or break a first impression. Make sure you keep them looking their best. The key is to get ahead of possible carpet damage by implementing carpet care measures into your everyday routine. Vacuum often going over high traffic areas slowly. Dirt can get stuck at the bottom of your carpets. The more you walk over it, the more difficult the dirt will be to remove. If stains occur, spray a small amount of gentle carpet cleaner over the area and let sit. After the cleaner has soaked into the stained area, blot with a cloth until dry. Try not to scrub stains harshly. This will ruin the texture of your carpets. Keep carpet cleaning supplies on hand. A lint free rag, carpet brush and gentle cleaning solution should take care of any unforeseen spills. The carpet brush is great for reshaping the carpet after you remove a stain. Designate areas near your doorways to take off muddy shoes and rainy jackets. A shoe rack and a durable throw rug work well to keep the mess at bay. On the outside of your doorways, encourage the use of doormats. Make sure they are long enough to catch a few strides worth of mud. Your four-legged family members can do just as much damage to your carpets as you can. Make sure to wipe down your pet’s paws after every outing and brush their fur to limit the amount of fur in your carpets. Make sure carpets have time to dry completely from the extra moisture being tracked in. If your carpets remain wet, mold will start to grow. Not only is this unattractive, it can be harmful to your health. Don’t forget about throw rugs and upholstery. Keep furniture out of the direct sunlight to avoid fading. Rotate cushions and blot spills right away so they don’t turn into stains. Choose your vacuum carefully. Some vacuums worsen air quality by kicking up particles from your carpets into the air. Make sure you use one with a high-quality filter. 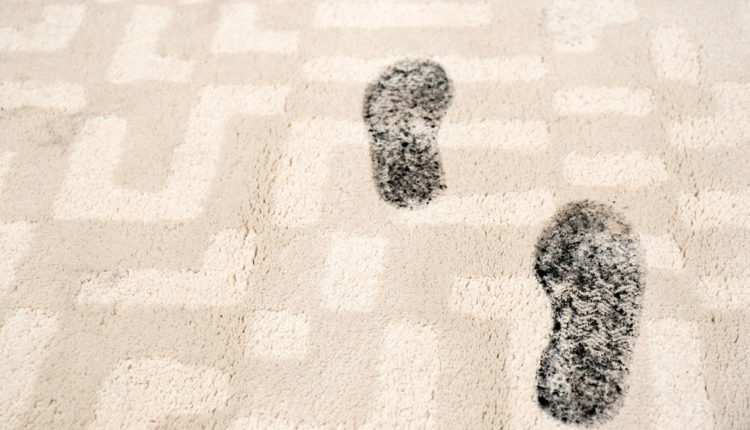 Inspect your carpets every six to twelve months to see if stubborn dirt and debris are building up. If you see mold, stains or stuck on dirt, it’s time for a professional carpet cleaning. ServiceMaster Twin Cities has almost 30 years of experience providing commercial and janitorial services in Little Rock, AR. Our expert technicians complete a comprehensive carpet training program to ensure your carpets are treated with the care they need. We are proud to protect your investments by providing a superior quality of clean. If you need to refresh your carpets, contact us for a free quote.